Vihren is the highest peak in Pirin. In addition to the height of 2914 meters, it is only seven meters lower than the record breaking – Musala, giving it a proud second among the highest mountains in Bulgaria. As to the size of the entire Balkan Peninsula, Vihren proudly occupies third place in size. Vihren rises in the northern part of Pirin’s main ridge between the peaks of Kutelo, which is northwest and Hvoynati which is towards the southeast. Vihren is located on the main ridge between two rivers and on a larger scale the highest peak of Pirin stands proudly with its extremely steep peaks between the rivers of Struma and Mesta. Vihren is located quite close to one of the best mountain resorts and ski centers in Bulgaria - Bansko. From Bansko to Vihren it is only about 12 km. The hut is the best starting point for many of the trails in the mountains. The most convenient way to reach the hut Vihren is by the asphalt drive, but of course you can take a brave quest to walk the distance to walk there. From the very start you will discover beautiful landscapes and scenery of the Pirin Mountains. Inside, the hut Vihren has been given the stamp of the 100 Tourist Sites of Bulgaria. The characteristic of Vihren is that it looks very different from different directions, which you can see. The hut by the side of the Vihren peak is a steep dome but if you look at Vihren from Bansko you will see its similarity to a truncated pyramid. Get it from the south, the panorama of Vihren can be likened to four sided pyramid. In essence, the rocks that make up Vihren are marbles. They do not retain water, which is why the whole area is on top of the rivers and lakes. Vlahina lakes are located closest, as they are in the southwest of Vihren . The plant world on the slopes can not compare to the richness of the fauna. Only in this part of Pirin meets Edelweiss, which is one of the rarest plants and accordingly protected by law and the marble steep rocks of Vihren are mostly studded with herbs and lichens. Representatives of animals here are birds, rodents, and mammals of the most frequently detected are chamois. 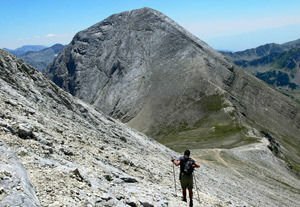 The best tip for Vihren is to climb it in the summer, during early July and late September. At this time of year the day is of the greatest duration and the weather conditions are most stable.